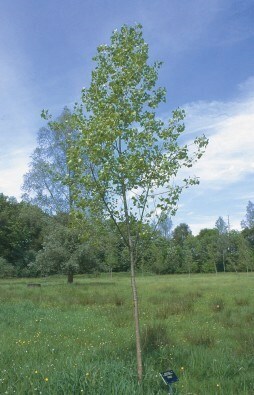 This Black Poplar tree has triangle to diamond shaped leaves that are green on both surfaces. The bark of mature specimens is gnarled and burred and has twigs that are hairless throughout. At maturity it forms a large, round headed tree and is a tough specimen that will tolerate exposed conditions and water logging, making Populus nigra very good for shelterbelt planting, woodlands and parks.